Welcome to Rock’s Famous Bar-B-Que and Catering restaurant in Prattville, Alabama! Dine in Monday – Thursday 10am to 7pm and Friday and Saturday 10am – 8pm at 307 S. Memorial Drive to try the BEST rib tips & pulled pork in the Tri-County area! Pick-up a plate or sandwich for lunch or dinner for the whole family! Have a special event that needs catering? Be sure to give us a call for a customized menu to make your event a hit! 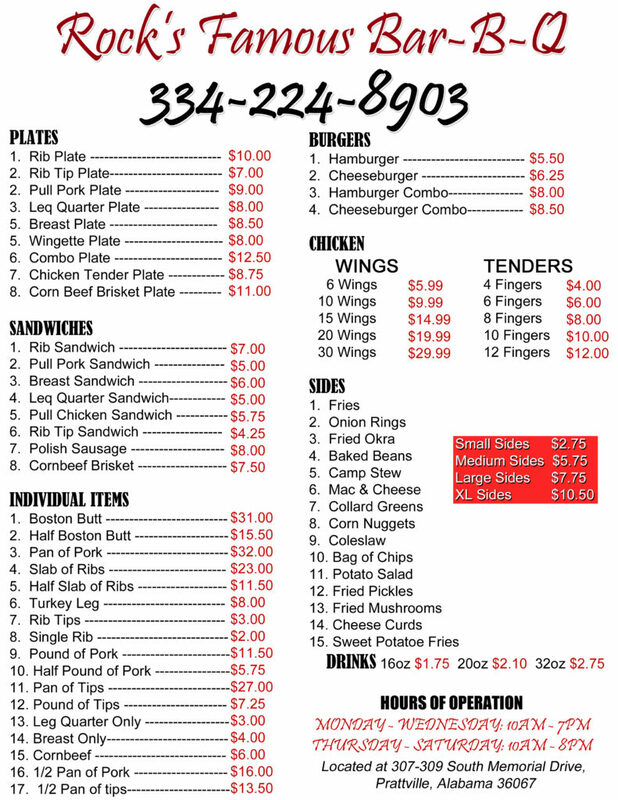 Choose from Ribs, Butts, Chicken, Hamburgers, Hotdogs, Polish Sausage, Fries, Camp Stew and more! To schedule an appointment to go over your catering needs or to call in and place an order for pick-up or delivery give us a call at (334) 224-8903!